Exciting news! The Bohemian Hall and Beer Garden is gaining a competitor, Studio Square Beer Garden Event Space, which is scheduled to open at the end of May. 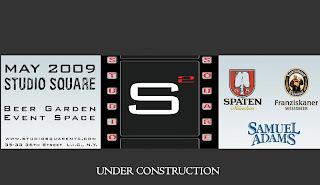 The space boasts an impressive 18,000 square feet and all the beer-gardeny culinary delights that the heart desires such as bratwurst sandwiches, black Angus burgers, beef and chicken kebobs and pulled pork sandwiches. In addition to the impressive-sounding food--it is a beer garden after all--it features over 15 imported (Spaten and Franziskaner), domestic and draft beers. In addition to bruskis, they'll also have various spirits and even sangria. I was surprised about this and kind of excited too. In terms of the neighborhood, Studio Square is located near Kaufman Astoria Studios and the Museum of Moving Image, hence its name. The atmosphere will be modern-rustic, with exposed brick walls, industrial fixtures, handcrafted communal picnic tables and fire iron pits. Entertainment promises movie nights and live music throughout the year. I think this will be a fantastic place, i live in the area and i am very excited.I have walked by there several times and spoken to some of the owners, which are good guys and they have a passion for beer,and they are also from the hood as well.So this will be my staycation spot for the summer. We shall see...I'm excited for it to open too! Okay, so we went there this weekend, Studio Square is really great. Start spreading the news about this place, okay? I was there on Sunday. It was my first beer garden experience. I really liked it. They had great LIVE music. Plenty of outdoor and indoor space. The menu offerings weren't too bad. They even had sushi! I know, I noticed the sushi too this weekend (I think it's new). They even had cupcakes sold in 4's, which is smart for birthdays. They even thought about candles and you can purchase these at the food counter. Pretty cool. The Bohemian Beer Hall just changed its opening hours to 5pm Mon-Fri. The new place opens at noon on Fridays. Guess where all the thirsty early weekend crowd will go. Yeah - the new one is open later too (until 4am whereas Bohemian is open until 2am).